This volume is a contemporary survey of practice-related issues in clinical neuropsychology in the United States. Section 1 includes chapters on topics relevant to practitioners in clinical neuropsychology such as managed care, practice trends, business aspects of practice, training and credentialing, internet resources for practice, and research in the private practice setting. Section 2 provides narrative descriptions of a range of different practice settings. Authors give firsthand descriptions of their settings, billing and coding practices, how they interface with colleagues and referral sources, and other unique aspects of their practices. Settings range from independent practices to university based departments for both pediatric and adult practices. The volume will be a valuable resource for graduate students interested in clinical neuropsychology, postdoctoral fellows embarking on a career in the field, and practitioners interested in enhancing their practices via the experiences of a diverse group of successful practicing neuropsychologists. Section 1: Practice, Training and Evolution of Clinical Neuropsychology. G.J. 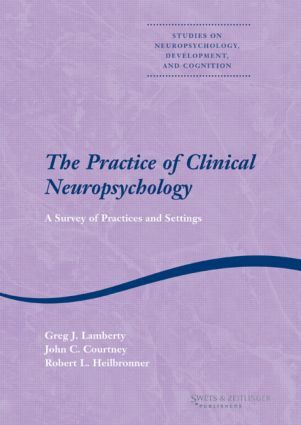 Lamberty, The Practice of Clinical Neuropsychology. L.A. Bieliauskas and B.A. Steinberg, The Evolution of Training in Clinical Neuropsychology: From Hodgepodge to Houston. J.J. Sweet and Paul J. Moberg, The Practice of Clinical Neuropsychology: Status and Trends. Section 2: Current Issues in the Practice of Clinical Neuropsychology. E.A. Peck, Business Aspects of Private Practice in Clinical Neuropsychology. M. Schmidt, Independent Practice and Managed Care. M.F. Greiffenstein, Neuropsychology Research in a Private Practice Setting. A.H. Risser, Internet Resources for the Practicing Neuropsychologist. Section 3: A Survey of Settings and Practices in Clinical Neuropsychology. R.L. Heilbronner, The Independent Practice of Clinical Neuropsychology: One Person's Perspective. J.C. Courtney, Private Practice with a Physician Partner. D.S. Bush, On the Practice of Forensic Neuropsychology. I.J. Torres and N.H. Pliskin, Adult Practice in a University-affiliated Medical Center. K.O. Yeates, A.N. Colvin and J.T. Beetar, Pediatric Practice in a University-affiliated Medical Center. D.C. Osmon and Y. Suchy, Management of a University-based Attention Deficit Disorder and Learning Disorders Clinic. R.C. Delaney, The Practice of Clinical Neuropsychology in a VA Setting. M. McCrea, The Practice of Clinical Neuropsychology in a General Hospital Setting. J.H. Ricker, Neuropsychological Practice in Medical Rehabilitation. K.J. Nies and B.A. Marcopulos, Neuropsychological Practice in Rural and Small Communities: An Appalachian Perspective. N.W. Walker, K.J. Nies, and R. Lorber, Practice in the Schools.